Last night we went to a party. A friend of ours graduated from nursing school. For the first time in more than 20 years, I felt completely comfortable at a party. I could hear conversations. I could choose what conversation to participate in based on the topic, rather than on what I could manage to strain and catch snippets of – or not, at the case often was. I could actually hear everything that was said, rather than trying to interpolate from context. It was a truly amazing experience. I have a large number of learned behaviors stemming from being deaf on one side – everything from positioning myself so that my cone of hearing encompasses the conversation I want to hear, to fading into the background when it’s just too frustrating to try to pick out what’s being said. For the last week, I have very intentionally sat in places where people are on my left. Turns out my cyborg ear is actually significantly better than my “good” ear, with this new device, and I have even had to turn it off in order to focus on what’s happening on my right side. Bizarre. I keep wondering what this new hearing is going to do to my habits – how quickly I can overcome 25 years of conditioning, or if it can be overcome. I’ve hated social situations for years – not so much because I’m not a social creature, but because of how embarrassing it is to be unable to hear, to have to ask for things to be repeated again and again, to feel like I’m missing at least half of the conversation. I wonder how much of it is habit now, and how much of it is just a reaction to the situation as it happens. Last night, I was able to carry on conversations, but I was acutely aware the whole time of how amazing it was to be able to hear. I wonder if when the novelty wears off, I’ll be able to just participate normally, and not revert to my habits. About 25 years ago, I had a tumor removed from my left ear. It was in the canal, in the middle ear area, and consumed the ossicles and the ear drum. Once the tumor was removed, I was almost completely deaf in my left ear. A few years later, we discovered that the tumor had not been completely removed, and had grown back. I had a second surgery in 1987, which removed more of the surrounding bone, and left me even deafer. As part of that surgery, I had an experimental device installed. A titanium/steel screw was installed in my skull, just behind my left ear, and I got a hearing aid – a Xomed Audient – which attached to that screw by means of a magnet. A body device, about the size of a cell phone, was worn somewhere on the body, say, in my breast pocket, and a cord went to the magnet attached to the screw. The device was the microphone and amplifier, and the magnet was the speaker. This device allowed me to hear, but at quite a price. Wearing something that large meant that every time I met a new person, I was obliged to explain to them what it was. Teachers assumed I was listening to music. Kids made fun of the device. It fell off all the time, or would fall out of my pocket when I ran or bent over. But mostly it was the feeling that I was weird that prevented me from wearing it all the time. Several years ago, the Xomed company stopped making the device, and replacement parts got harder to find. And I just adjusted to being deaf on one side. This meant that in social situations I always maneuver into a seating position where I’m at the extreme left end, and everyone is on my right. If I miss out on that seat, I spend the entire time either contorting my neck to be able to catch what is said, or, more frequently, I just withdraw and don’t participate. About 3 years ago, the Xomed quit working entirely, and I simply didn’t go to get it fixed. Even now that I’m 36, there’s a social cost to having to explain to everyone I meet why I have this device attached to my ear. Although I expect that with the ubiquity of bluetooth ear thingies, I’d have to explain less than I once would have. Be that as it may, I simply didn’t get it fixed. The cost of wearing the device outweighed the benefits. About a year ago, I started seeing more and more and more people – mostly children – wearing hearing devices attached behind their ear. Knowing how embarrassing it is to have attention drawn to this, I avoided asking any of them about it, but I started getting more and more curious. Yesterday, I went to the ENT (Ear, Nose Throat) doctor. 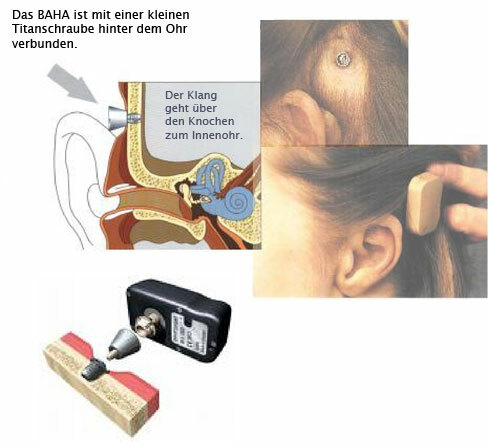 I first talked with the audiologist, and she said, what you need is a BAHA. While waiting for the ENT, I looked up BAHA on the web, and found this page at U Maryland which described it in some detail both the device and the procedure. What could be simpler? Here’s more technical information from the company that makes these things. Bone conduction hearing is hardly a new concept. It’s how Beethoven continued his music career after going completely deaf. He sawed the legs off of his piano, and then laid on the floor to feel the music through his bones. So, if all goes well, in just a few weeks I’ll be having a new screw installed in my skull. It will have to heal for 3 months. During that time, the bone actually grows into the micro-holes in the screw, to completely anchor it in the bone, so that it won’t move when the device is attached to it several times a day for the next few decades. Once it is firmly anchored, I’ll get the external device that snaps onto the screw, and, after 25 years of being deaf on one side, I’ll be able to hear normally. For those of you who hear normally, you may have never noticed how I twist my head to hear you, or arrange to sit or stand on your left side, but you’ve certainly noticed how I ask you to repeat things again and again, or seem to give inappropriate responses to things when I simply get too frustrated trying to figure out what you’re saying. Hopefully, 4 or 5 months from now, that will no longer be the case. I’m really excited about the prospect.